[dropcap size=big]W[/dropcap]hen it comes to luxury lifestyle gift lounges, nobody does it better than GBK. Just ask BizBash, who routinely awards GBK with the “Best Gift Bag” accolade. The special events company recently honored the 2013 MTV Movie Awards Nominees and Presenters with its Annual Gift Lounge on April 12th and 13th at the W Hollywood Hotel. But the event wasn’t just about the glitz and glamor of Hollywood; it was also a time to bring much needed attention to wonderful causes. GUARDaHEART Foundation is a non-profit foundation dedicated to raising awareness of heart disease prevention was on site, offering complimentary blood tests to assess risks for cardiac arrest. They also promoted their savethe1.org campaign. On a bitter-sweet note, the event marked the 10-year anniversary of John Ritter’s passing. The actor was claimed by heart disease. 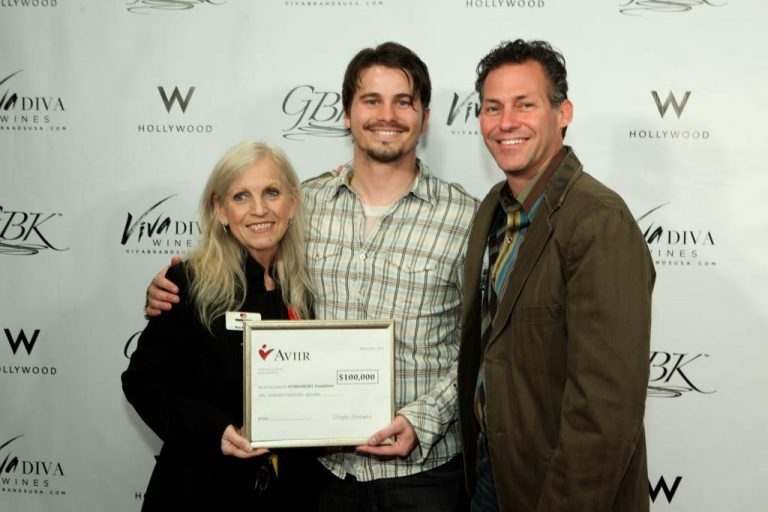 In a moving gesture, celebrity guest Jason Ritter made a special appearance to co-present a check with Aviir for $100,000 to the foundation. Other charitable causes at the event included The Sugar Ray Leonard Foundation, which is raising funds for research and awareness towards a cure for juvenile diabetes. Lopez Foundation, co-founded by actor-comedian George Lopez, was also present. The charity’s mission is to create positive, permanent change for underprivileged children, adults and military families confronting challenges in education and health, as well as increasing community awareness about kidney disease and organ donation. My Life My Power is a 501©3 charity which works with kids, parents and schools around the nation with issues like bullying, drugs and alcohol, and dropouts. Steps4Paws is brings the fashion world forward to support dog rescue organizations, saving lives one dog at a time. Finally, Lambda Legal, an organization that has led the fight for equal and fair treatment of lesbians, gay men, bisexuals, transgender people and those with HIV through impact litigation, education and public policy work, also had a presence at the GBK Annual Gift Lounge. Celebrity guests enjoyed the lounge, snacking on KuKuRuZa Gourmet Popcorn, who also provided a specialty popcorn bar. Music was supplied by DJ BABYCHINO, who is the world’s youngest DJ. Gifts were provided by a slew of food, apparel and beauty sponsors, including Viva Diva Wines, Sabra Dipping Company, Respect Your Universe, Keratin Complex, Designer Skin and more. One of the highlights of the event, however, was Sparkling Hill Resort, which gifted guests a 5-night Couples Escape certificate, which included access to a 40,000 square foot spa and over 100 treatments and therapies. GBK never fails to impress in its lounge designs, celebrity guest lists and inspiring roster of sponsors. We can’t wait to see what they come up with next!